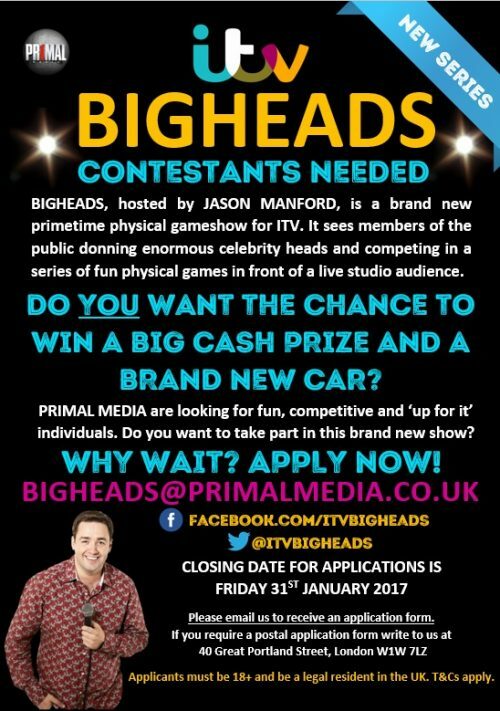 BIGHEADS, hosted by JASON MANFORD, is a brand new primetime physical gameshow for ITV. It sees members of the public donning enormous celebrity heads and competing in a series of fun physical games in front of a live studio audience. DO YOU WANT THE CHANCE TO WIN A BIG CASH PRIZE AND A BRAND NEW CAR? We are looking for fun, competitive and ‘up for it’ individuals. Do you want to take part in this brand new show?